Sparks in potentially explosive environments can quickly cause a dangerous fiery inferno. If you perform weighing in hazardous settings, safety needs to be the top priority and your equipment must have the proper features to prevent explosions from occuring. High-explosive areas: Situations where you handle or use explosives, such as in demolition, or other flammable chemicals such as petrol. Chemical facilities: Chemical facilities often have toxic vapours that may not cause an explosion by themselves, but are highly ignitable. An explosion proof scale is designed to contain sparks and explosions, which in turn inhibits further ignitions. 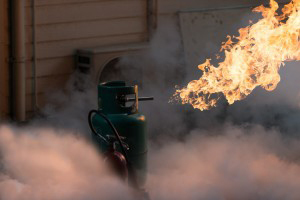 This is crucial particularly when an explosion is caused by gas or combustible dust, as these explosions can quickly cause fires through sparks and flashes. Using an explosion proof scale in hazardous environments can keep your workplace safe, employees safe and protect them from injuries and accidents. The triple range HV-CEP series weighing scales are IECEx compliant, providing an effective weighing solution for a range of applications. 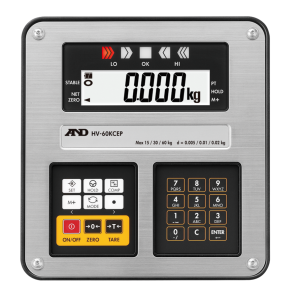 The series has a wide selection of capacities and resolutions, allowing you to select a scale that best suits your application. The HV-CEP also comes with a IP65 dust and waterproof base unit, which means you can weigh objects with without hassles from moisture and dust interference. The stainless steel pan is resistant to chemicals, scratches, rust, and is easy to keep clean and hygienic. With the multi-coloured 5-step LED comparator lights, check weighing becomes far more accurate and efficient. Comparisons can be made in three levels, five levels, or seven levels for both normal weighing and piece counting. The HV-CEP scale also performs tare automatically when the weight reaches a pre-set target range and negative values can be used as comparator limits. By combining these two functions, ‘take-away’ check weighing becomes possible. The key lock function prevents operators from making unwanted changes to the scale settings, while the auto power OFF function helps save battery power when it is inactive for a pre-set period of time. Keep your employees and workplace safe by using the right equipment in hazardous areas. 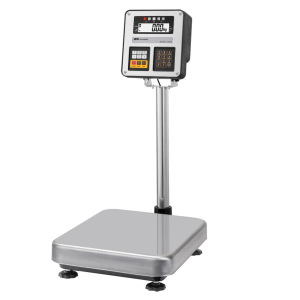 The HV-CEP series weighing scales will be available from 2019. To find out more, please contact A&D Weighing at 1800 241 434 or fill in our online contact form.